Conjunctivitis or ” pink eye” is an inflammation of the conjunctiva, the lining covering the inner eyelids and the whites of the eyes. The main symptoms of conjunctivitis are irritation, itching, red eyes, swelling, purulency, etc. – Diseases: Conjunctivitis may be the manifestation of physical diseases, especially of allergic nature (Allergic conjunctivitis). Sometimes it responds to microbial infections, either bacteria (bacterial conjunctivitis) or viruses (Viral conjunctivitis) In the latter group, we will find most of the conjunctivitis resulting from cold, influenza, sore throat or other respiratory diseases. Excessive fat, such as in seborrheic dermatitis, can reach the eyes when, after touching the forehead, we put our fingers on them. – Chemical aggressions: When some chemical products, such as lye or caustic soda, touch the eyes they usually irritate the conjunctiva, leading to very painful chemical conjunctivitis. This type of accidents are responsible for eye scarring and can damage one’s eyes internally. – Bad habits: The habit of rubbing one’s eyes is the main reason for microorganisms to enter into the eyes. Sometimes, the eyes suffer the results of negative habits of conduct, such as excessive reading in low light, activities that require excessive concentration in the same spot and the same distance (computer working, watching television, etc); Work performed under artificial light, without sunlight, can occasionally redden the eyes. – Poor eyes hygiene: A poor hygiene of the eyes with irritants such as detergents, soaps or cleaning products can cause eye irritation. – Environmental situations: Working in an environment loaded with smoke, dust or other pollutants can cause conjunctivitis. Similar effects can occurs when working in a place with high luminic contrast. – Unsuitable diet: A poor diet can lead to poor eye health. 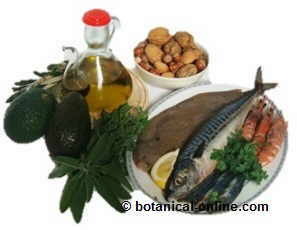 Essential fatty acids (omega 3 and omega 6), vitamin A and vitamin C are necessary to mantain eye health. – Free radicals: A poor diet, aggressive environmental conditions and the oxidation of the body itself are the causes for the appearance of free radicals. Vision is one of the most sensitive senses and the most affected by oxidation. An eye problem firstly requires a visit to your doctor or specialist who can diagnose the real causes of the disorder. This is particularly necessary and has to be done quickly in case some chemical reaches your eyes. Conventional treatment of conjunctivitis depends on the type of cause that produces it. In case of bacterial conjunctivitis, antibiotics could be needed when conjunctivitis does not cure itself during the first 2 or 3 days. As for allergic conjunctivitis, some antihistaminic medicine or topical steroid drops could be applied. Chemical conjunctivitis could require applying saline solution. Artificial tears could be very valuable for the treatment of viral and allergic conjunctivitis. The natural treatment of conjunctivitis involves using a series of plant resources that will prevent or cure it. More information about conjunctivitis and its natural treatment.